When it comes to car maintenance, inspecting the belts and hoses is one task that often gets overlooked. After all, belts and hoses might not seem like a major part of your car. But if these simple parts fail, you could be left without power steering, air conditioning or electrical power, and your engine would almost immediately overheat. First, shut off the engine, and give it time to cool. This is important, as you will be handling parts that become scalding hot while your car is being driven, and a moving belt or fan could easily cause you to lose a finger. Check the belt (or belts) for obvious signs of wear. The top or outer part of a belt should be smooth, with no cracks or frayed edges. Bend or twist the belt to check the grooved underside for cracks. Small cracks in individual grooves are normal, but a crack that is deeper or wider than a groove could be the start of a break. 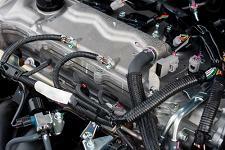 Likewise, check the coolant hoses at the top and bottom of the radiator for any cracks, nicks, scratches or bulges. Look for any glassy, hardened spots in the rubber. These indicate heat damage. Check the coolant level. Low coolant indicates a leak, which may or may not be located in the hoses. You can often track leaks by looking for coolant residue, which is usually white, green or pink. If the belts or hoses show any of these signs of wear, they should be replaced. If you have any questions — or, if your car itself needs to be replaced — contact us at Swapalease. We’re happy to help. This entry was posted in Car Maintenance & Repair and tagged car maintenance, coolant hoses, coolant levels, power steering, radiator, serpentine belt by admin. Bookmark the permalink.